British press photograph. Approximately 20 x 26cm. Shows a Beaufort dropping a torpedo during a practice flight. 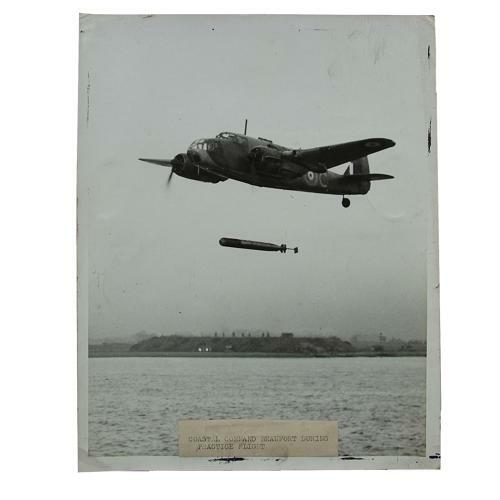 Captioned to rear 'A Coastal Command Destroyer - This new series of photographs includes the first ever to be taken of torpedoes being dropped from Beaufort aircraft of Coastal Command. This fine aircraft, which is ideal for the the job, carries the 'tin fish' in a recess in the fuselage, and its use against Nazi coastal traffic from Norway to the Mediterranean in support of the activities of the Royal Navy should do much to shorten the war.' A little dog-eared/creased. Stock code P22873-96.